Phyllis Isley's parents ran a travelling stage show, the Isley Stock Company, and she helped out by selling tickets and popcorn. When her parents eventually grew weary of staging tent shows, they bought a theater to show newfangled "motion pictures". Isley Theaters soon became a leading chain with movie palaces in Oklahoma and Texas, and as the movie business boomed the family was largely immune to the effects of the Depression. The girl who would be Jennifer Jones was sent to a private Catholic high school followed by New York's American Academy Of Dramatic Arts. She met and married Robert Walker at acting lessons, and they came to Hollywood together. They both went on to act professionally, but their marriage was doomed after she auditioned for David O. Selznick, who had already made his name with Gone With the Wind. 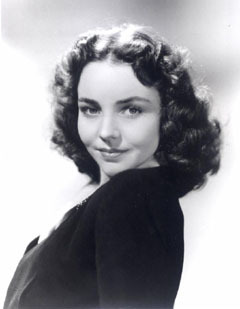 Selznick signed her to a long-term contract, renamed her Jennifer Jones, and cast her in the lead in the saintly Song of Bernadette. For this role, she won the Oscar but lost Walker. She attempted suicide as her marriage ended, but eventually she took up with Selznick, and as soon as he divorced his previous wife, they were married. Jones' films include the sepiatone romance Portrait of Jennie, the all-star World War II tearjerker Since You Went Away with her then-husband Walker, the sultry western Duel in the Sun, and the offbeat tongue-in-cheek melodrama Beat the Devil. Her career faded in the late 1950s, and sputtered to a halt after Selznick's death in 1965. She met and married her third and last husband, Norton Simon, a successful self-made businessman who had started by buying a fruit and vegetable stand and ended up owning Hunt Foods. For the last decades of her life she was President of her last, late husband's Norton Simon Museum, refurbishing it with a well-received Frank Gehry redesign of the structure in 1996. Jones returned to the screen in the skyscraper disaster Towering Inferno (1974), but then settled in for life as a millionaire's wife and museum president. In 1975 Jones' daughter, Mary Jennifer Jones, jumped to her death from the 22nd floor of a Los Angeles skyscraper. Jones' husband had lost a son to suicide years earlier, and to honor their dead children Simon and Jones endowed the Jennifer Jones Simon Foundation For Mental Health And Education in 1980. Find-a-Grave reports that her remains are interred in the Selznick Family crypt of the Great Mausoleum at Forest Lawn Glendale, but this appears not to be the case. Hollywood Walk of Fame 6429 Hollywood Blvd.